In the December 2014 issue (PBB No. 152), we announced that the American Boat & Yacht Council (ABYC) wanted to divest itself of the Westlawn Institute of Marine Tech­nology, which it had hosted since 2003, citing the venerable distance-learning school as a financial burden. In this column we urged any qualified, financially sound person or school to step up and keep Westlawn from going under. Two issues later, in No. 154, we announced that West Coast sailor and former Westlawn student David Smyth, then 57, had bought the distance-learning school. In a telephone conversation he excitedly described his plans for adapting to the new technologies available such as “open online learning opportunities.” A chancellor and provost had been hired, and former director and CEO, naval architect Dave Gerr, reportedly had been retained to help develop course material. A recent visit to the school’s website, however, revealed few if any signs of life: no new news since 2013; no newsletter, The Masthead, published since December 2014; and no job postings. So it seemed time to ask Smyth what’s going on. During a lengthy conversation, Smyth detailed a few of the challenges he has faced. Some of the learning systems he had come to admire at major universities like M.I.T. proved “fairly expensive.” And a hard look at graduation rates was disappointing: of 236 registered students, only “two to 15” were expected to graduate. Current active enrollment, he says, is around 60 worldwide. So even though the school depends almost entirely on student tuition fees, it didn’t make sense to keep recruiting students who weren’t likely to finish any of the various programs. Where in years past the NMMA (National Marine Manufacturers Association) and ABYC subsidized the school, that obligation now falls to Smyth and his personal finances. He says he has pumped in “tens of thousands of dollars,” which is easy to believe. The school maintains a physical office at the Maine Maritime Museum in Bath, occupied by program assistant Cynthia Dolloff, and pays instructor Mark Bowditch, based in Australia, to grade papers and support students through interactive exchanges. To complicate matters, Smyth says he wasn’t given the school’s financial records, and so has had to pay accountants to sort through what records were available and create a sensible financial picture to aid in future planning. Smyth has made a number of significant changes to control costs and improve graduation rates. All assignments are now uploaded electronically to the school’s server—no more paper. And tuition payment plans have been scrapped in the belief that a student who saves the $4,500 fee (plus $100 per month) per module will be more committed to completing the course work than someone who makes small payments and becomes discouraged or disinterested. For advanced students, Smyth says he invested in a license for MAXSURF, a professional-grade software suite widely used in the industry. This is in addition to enrolling all students in available free software opportunities such as AutoCAD, Inventor, and even subscriptions to Professional BoatBuilder magazine. While Smyth talks about the school positively and passionately, there are reasons to be concerned about its future. As he points out, depending on student tuition to fund the programs is not sustainable. Founded in 1930, the distance-learning school will celebrate its 90th birthday in just two years, and using that as cause for donation, Smyth is hoping to launch a fundraising campaign that will include alumni and members of the boatbuilding industry. A graduate posted on Facebook about his work and the career opportunities he found. Now Westlawn is seeking to boost graduation. I agree. But given the fact the website and Facebook page reflect virtually no activity since the sale and purchase, one can’t help but wonder if the school lacks the necessary energy and resources to thrive and fulfill its mission. 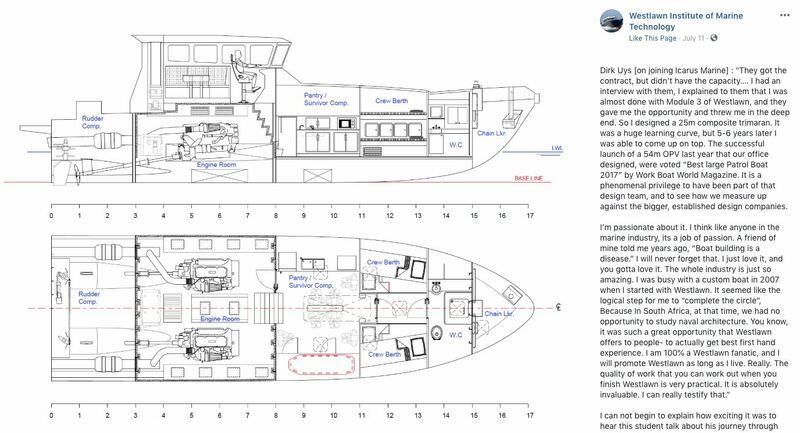 On a personal note: With a certificate in Elements of Technical Boat Design (formerly Yacht Design Lite), I told Smyth I won’t be able to give him $5,000, but I’ll happily donate $100. What school today doesn’t rely on fundraising? And it starts with alumni and the industries it serves. I’d enjoy hearing more from current and recent students regarding their experiences and suggestions. Please e-mail me at dan@nullproboat.com.